One of the biggest concerns for healthcare providers today is pressure, dealing with stress. How do you deal with the pressures of day to day? Hi, I’m Dr. Brian McDonough and welcome to Primary Care Today on ReachMD. My guest today is Dr. John Kelly. He’s really known as a Clinical Professor of Orthopedics at the Hospital of the University of Pennsylvania, University of Pennsylvania, but in addition to that, he has a side interest, an important interest in humor, helping people deal with stress. And did you come across that, John, just because you were feeling pressure in your own life? Where did you get the interest? Well, I have to thank my genes and my parents. My father was a standup comic, and I grew up with 1 big monologue. I mean, he’d walk in the kitchen and say to my mother, “Chicken, again?” He would say in our house my mom’s such a bad cook we pray after we eat, so I just grew up with all these types of jokes. But the truth is, I had been burned out, and I thought, I’d say 15, 20 years ago, I was at the bottom, just burned out, probably low-grade depression. Interesting, there’s probably a lot of cross-correlation with burnout and depression. And I said, “Well, how can I get out of this funk?” So, you know, happiness is a choice. I chose to look at the bright side of life. My dad, before he passed away, I said to him, I said, “Dad, anything you want to impart to me, wisdom-wise? One thing you want to tell me?” He goes, “Yeah.” And he was a boxer, and he talked like he was an old Irish guy. He said, “Don’t take yourself too seriously.” Such great wisdom. So, I think one of the greatest antidotes to burnout is: don’t take yourself so seriously. You know, happiness is a choice. We can choose to dwell on all the negative, or we can look at the bright side, and that’s the choice. Is surgery a specialty that puts more pressure on you? I would think just going in and doing an operation every day, you got all those deals. Oh, absolutely. I mean, every case I do, particularly like the shoulder, but you’re always near a major artery or nerve, and we all do our best work when we’re relaxed when we’re in the moment. How do you get into the moment? Well, you can do meditation/yoga, but also comedy. Comedy, done appropriately, is a great tool for mindfulness. When you’re practicing humor, it brings you back to the present moment. So, I use comedy to diffuse tension. I make patients a little less nervous before the surgery. And it has to be appropriate. It has to be edifying and not effacing. You can be self-effacing, but you can never use humor as a weapon, but it’s a tremendous antidote to stress. And don’t forget, Brian, you and I are healers. We went to medical school to heal. And if the good Lord put us on this earth to serve other people, what better way to serve them than to make them happy? It’s been said that emotions are contagious. When you bring up the brighter side of life and look at the mirth and the comedy and make people smile, then that to me is healing in its most pure essence. We have lots of people who obviously are in primary care, who listen to this program, watch it, and physicians across who take advantage of ReachMD and they do it… so I see, you probably are tapping into something that a lot of people are facing, because statistically in the general public, I guess depression is 1 out of 8. Is it higher in medical circles? Absolutely. The burnout rate… We’re in a crisis now in healthcare. The burnout rate in some surveys is as high as 50%—surgeons, particularly. Now, if you look at residents, roughly 47% of residents are burned out, and the highest risk is the PGY-2. And there are a lot of reasons for that: electronic medical record… You know, our residents now have become pretty much scribes. They spend more time online than they do probably asleep. And we all signed up to help people, but with that now is this inclusion of technology, and we’ve all become really a victim of overstimulation technology. We’ve lost person-to-person contact, which we’re all social beings and we need that to buoy ourselves and to lift our spirits, but when you’re tagged to a computer all day, it’s hard to be happy. And there are actually good data that the more time you spend on your computer or cell phone, the less happy you are. Now, what about that? How do you get around it? Obviously, we grew up in a time we were writing on paper; everything seemed fine. I found a document I’d had. I’m chairman of my department, and I had A Family Practice Office and How to Improve It, and I wrote it 25 years ago, and it was a memo. I was just clearing out my desk. And I looked up the 5 problems and the 5 things we had to correct, and they’re the same 5 problems 25 years later. Like, I’ve done nothing to improve this department in my eyes, but we’ve spent thousands, if not millions, on computers and on technology, and yet, it’s the same problems. And it really all came down to: Are you going to stay that extra 20 minutes to see a patient? Are you going to come in early to do somebody? Are you going… all the things that we do in care, but none of that has been taken care of by computers. Computers have just, in a way, served as a barrier. So, what do we do about it? Well, it’s a very convoluted answer I’m about to give, but it’s about energy management and delegation. I am blessed to have a wonderful PA that does a lot of my electronic transcription, and I don’t go overboard with documentation. It probably could be a little better in some realms, but I think that you have to make that conscious decision that technology is going to be your servant and not your master. So, I apportion certain times to answer emails during the day. I don’t do it all day. I’m not wedded to my iPhone. When I’m in the OR, I put my cellphone down. They are some colleagues I’ve seen have the Bluetooth in. You can’t have good quality work when you’re doing 2 things at once. In fact, there’s good data that multitasking diminishes the effectiveness and the quality of your work, so I would not want to go to a surgeon who’s on his Bluetooth during the case. It’s called mindfulness, present-moment awareness. So, you can’t be doing 2 things at once. And again, the literature is clear. When you attend too many things at once, the quality of those actions diminishes. Can you imagine, for instance… I know your wife Diane. Can you imagine talking to Diane while you’re on the Blackberry? That just diminishes the quality of the conversation. And you probably forget what the score was when you’re looking at the Sixers’ game. So, I think it has to be a conscious choice to make those decisions to limit technology time at certain times of the day and not to be so available. It’s all about setting boundaries. Well, we’re talking about residents, for instance, and the issues. You said PGY-2 might be a challenging year, but if you look at residents—I mean, at a lecture we tell them not to—but basically, you’ll see them, young people, on their phones all the time. I was watching a baseball game the other night. I’m watching. If you look at the fans, there were fans… It was a Dodgers game, and the Dodgers game, if you watch, you can see behind home plate and you’ll see the fans very clearly. Well, these 4 fans who were there were not looking at the game. It was distracting to the point where they were just looking at their phone. They’re behind home plate, they’re watching the Dodgers, they probably have the best seats in the house, and they’re not even looking at the game. I suggest… I actually write columns for physician stress, and the last one I wrote was about going on a low-tech diet. I used it in an allegory. Our daughters went to school together. I was at one of my daughter’s hockey games, and I got out of work. As a surgeon, it was hard to make it. I got there around 4:00. She was so happy. She was excited to see me. And wouldn’t you know, my Blackberry went off, it vibrated, I looked down, and Mr. Compulsiveness, I want to make sure I saw… I heard the whistles blow. “Oh, I’ve got to finish the message.” And I looked up only to find my daughter had scored a goal and she saw me looking at the Blackberry. Boy, talk about not being in the present moment. That was a great lesson for me. When you’re at the game, be at the game. When you’re on the Blackberry be… So I should have left it in the car. So, again, there’s data; the more time you spend wedded to your iPhone, the less happy you are, and also the less conditioned you are because we tend not to work out. We just become virtual existences. But you and I grew up in a time where we just played. I was born and raised in a row house. I’d walk outside. I played baseball all day. Now you’ve got these computer games and virtual reality. I’ve been in rooms with young people where they’re in the same room and they won’t say “Hi;” they’ll text. So, what does that do to our social needs? We’re social beings. We need interaction. So, if we look at medicine and the doctors, one of the things young doctors— all doctors, but young doctors in particular—worry about is the technology. What other barriers are there? Well, the barriers are just you can’t be all things to all people. You have to set boundaries. And 80% of your happiness is due to relationships, so if your relationships in your life are not in check, forget everything else. You and I both have great marriages, but we work at that. You know, you have to prioritize relationships, and if they’re not given much attention, they’re going to degrade, right? Happiness is a choice. It’s about making decisions that give you energy. So, if you’re going to be a compulsive workaholic, you’re going to burn out. If you decide to work on your parenting skills and time with your children, decide to be a good husband, a good wife, decide to invest in a hobby, you’re going to have a happier and more energy-filled life. It’s a decision. What are things you would suggest? Some of them we’ve already given tips to doctors, people listening, that could make their lives better if they feel they’re under the gun. The first thing is to ask themselves: How happy am I? How happy am I today? And happiness is a choice, but happy doctors give better care. The one mantra I try to tell our residents is that “You have to ask yourself every day, ‘What am I doing now to give me some peace?’” because happy doctors give better care. They’re named in less malpractice suits. They have more compliance with patients. Patients listen to happy doctors. And remember, Brian, you and I are in a healing profession. We can’t give what we don’t have. If our tanks are dry, we have nothing to give to our patients. You start giving substandard care. I have 6 surgeries tomorrow. I better get a good night’s rest, spend time with my wife, say my prayers, all the things I do to nourish myself, exercise, so I can be fully present and give my best game. If I’m tired, up all night writing that paper or had a squabble with the missus who I feel estranged from, I show up, I get my B- game. That’s not fair to patients. Happy doctors give better care. So, the question our audience has to ask is: How happy am I? And if I’m not, what is out of balance? What decisions do I need to make to get back in balance? The literature is clear that there’s a certain quantum of work that we all need to be happy, and after we exceed that, we become less happy. Henry Ford nailed this years ago. The origin of the 40-hour work week was from Henry Ford. He realized that if his employees worked 40 hours and he paid them more, they became much more efficient. He actually cut back their hours, paid them more, and the productivity rose. So, there was a study—I forget the author’s name—but if you work more than 40 hours a week, say 60 hours, which we all do, our productivity for the first 3 weeks is a little higher, and after 3 weeks it degrades and actually becomes lower than those that work 40 hours. So, 40 hours, it seems like the magic number. Now, you’re probably laughing at me. How many doctors work 40 hours? Not many, but we can do it, and we don’t have to sacrifice much, and our quality of work will actually go up. Let’s switch gears. We talk about the hours. Residents now have hour limits. They can’t work as many hours. It doesn’t seem to have made them happier. Yes, I think that’s because they’ve neglected the energy throughout of that. For instance, I’m an orthopedic surgeon. If a resident is up all night working up a hip fracture and he’s really dying to do the case and it’s going to make him happy, I’ll let him do the case, and I say tongue-in-cheek, “Make up these hours somewhere else.” So, if they are engaged in an activity they really love doing, let them do it. It’s all about energy management. It’s not so much time. It’s energy management. So, we have to say no to those things that deplete us, say yes to things that give us sustenance. And for most orthopedic or surgery residents, they want to be in the OR, so if they spend time paying their dues and they want to get refreshed and regenerated by doing a case, then God bless them, they’re going to do the case. Well, we borrow from Peter to pay Paul. Say, “Well, then you have to do less work this weekend,” so we get that 80-hour bank account. So, you try to let them have their fun and do what they enjoy as part of it. If that’s going to buoy their spirits and give them higher energy, let them do that instead of being so austere and say, “Well, you were on call last night; you have to leave at exactly 7:01.” If I do an hour hip fracture case and they want to do it, fine. I know you lecture all over the country on this topic. Are there things in doctors’ personalities that make them more likely to suffer from depression or have these issues? Absolutely. You know, it’s been said that many of us seek to heal because of our own inadequacies to try to mend ourselves, to heal ourselves, and I think that, number 1, you have to recognize that you have to master your own life first before you can really treat others effectively. So, I’ve been through therapy. I’m seeing a counselor, going through some issues. I’m a child of an Irish Catholic family, a lot of alcoholism in my family, a lot of wounds growing up, so you have to name it to tame it. Take care of your own house so you can be present and minister to other people. Problems, for instance, like perfectionism, obsessive-compulsive disorder, which a lot of us suffer from, they don’t just go away. They need to be managed. They need to be faced head-on. For years I struggled with perfectionism. When I first started to practice, I would do the hour knee arthroscopy. It had to be perfect, said a voice of perfectionism. Now I can do maybe 8, 10 arthroscopies in a day and not be that tired because I learned the art of just flow, just being present, doing the case and not listening to those voices. So, I think it's getting help, do heroic self-evaluation, say, “What are my issues here? How can I get help?” And one of the ways you can find out is what pushes your buttons. There’s usually an old childhood wound there. My dad was a good guy but critical, very critical. He was an alcoholic, so criticism is one of my buttons, and I realize I’ve got to work on my self-concept because I shouldn’t be so sensitive. The other thing is workaholism. We all try to prove our worth through work, and I see people just work themselves to the bone, doing more and more and more, and that was my default option for years. When I wasn’t feeling good about myself, I’d take on more work, try to make sure that I felt worthy. Then I’d wake up and just, oh my gosh, I can’t believe I got this chapter, this, and my OR schedule looks like the Bronx phonebook. What am I doing? If we could all come to the realization, whatever faith-based system you have, is that we’re already good enough in our Creator’s eyes and nothing we do on this earth makes us more valuable, really, in God’s eyes, and the Universe’s eyes, so if you come from that perspective that “I’m already good enough,” it frees you to do what you want to do, and you come from this perspective of abundance, not scarcity. I’ve got to prove this, but I can show you some of the best researches in orthopedics that are doing great, cutting work because they come from an abundance mentality. They’re happy. They’re creative. They’re spiritual. Not like, “Let’s look at the last 2,000 ACLs done,” rehashed, poor quality research. What I’m saying is this. Once you recognize that we’re already good enough, you come from a place of inspiration, of passion, enthusiasm—versus coulda, shoulda, woulda, then the quality of work will suffer. We have time for about one more question. I’ve asked you a lot. Is there something I didn’t ask you that you want to bring up that you think is important? Dr. John Kelly, thanks for joining us on Primary Care Today here on ReachMD. I appreciate your time. You’re welcome, Brian. You’re a good friend and you’re a great doctor. Some great advice. I thank you so much. And until next time, thank you for joining us. Ever hear the phrase, “Laughter is the best medicine?” As it turns out, finding time for a daily dose of humor could be key in combating burnout. 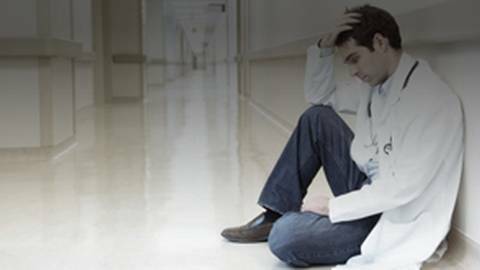 Physicians have one of the most stressful careers out there, forcing them to learn how to cope with high pressure on a day-to-day basis. And with the rates of physician burnout on the rise, adding a little laughter to your life and practice could be just what the doctor ordered. Sharing their experiences on learning to cope with these pressures and incorporating humor into their practice are Dr. Brian McDonough and Dr. John Kelly, Clinical Professor of Orthopedics at the Hospital of the University of Pennsylvania.